University of Oregon scientists studying neural stem cells in the fruit fly Drosophila have uncovered a molecular change experienced by stem cells as they age. During development of the central nervous system, a protein is expressed that blocks tumor formation. The research, detailed in a paper placed online ahead of print in the journal Current Biology, focused on the larval stage of fruit fly development. This is when stem cells generate most of the neurons that form the adult's brain. While rapidly dividing to produce new cells, these stem cells rely on the signaling pathway of the Notch protein. Previous research has shown that when Notch signaling runs smoothly, the stem cells make neurons that populate the adult central nervous system. With too much Notch, stem cells lose control and over-proliferate - forming large tumors. In humans, adult T-cell leukemia is tied to overactive Notch signaling. "Stem cells have a really tough job, because they have to divide to make the millions of neurons in our brain," said co-author Chris Doe, a professor of biology and a Howard Hughes Medical Institute Investigator based at the UO. "If they don't divide enough, it results in microcephaly or other small brain diseases, but if they divide too much they make tumors. They have to stay right on that boundary of dividing to make neurons but not dividing excessively and forming a tumor. It's really walking a tightrope." 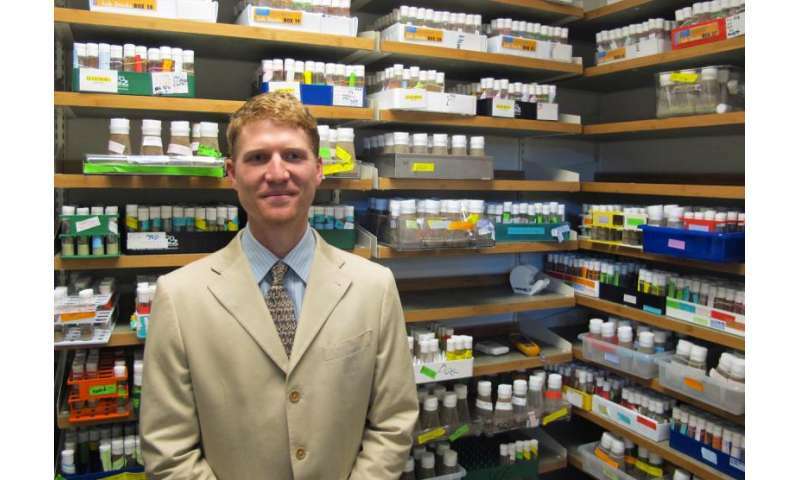 In the new research, UO doctoral student Dylan Farnsworth discovered that if he waited for stem cells to divide a few times and age a bit, they quit responding to Notch. At this point, stem cells cannot be pushed by high doses of Notch signaling to form tumors. He wondered why. Further study led to the discovery of age-related molecular changes. Late in their lives, and at about the same time they resist tumor formation, stem cells begin expressing a transcription factor protein, known as Eyeless in Drosophila and Pax6 in humans. Its presence blocks Notch signaling, Farnsworth said. When Eyeless is knocked out in these stem cells, the researchers showed, Notch signaling overwhelms the balance again and forms brain tumors. 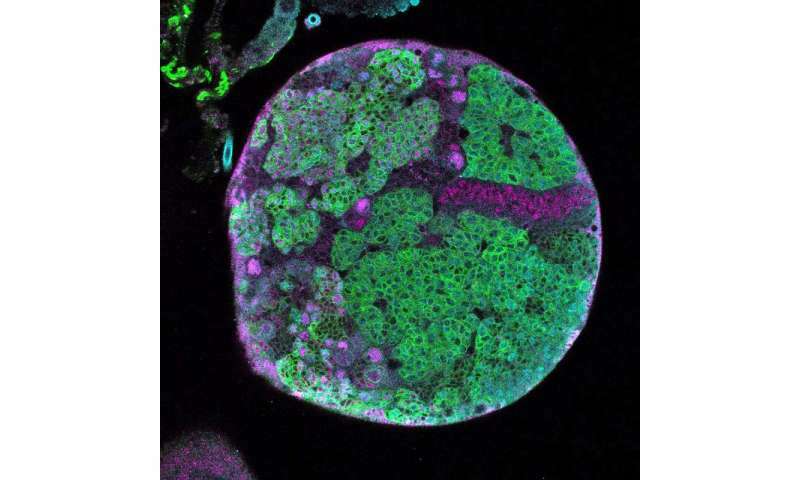 "If we can identify the stem cells that are relied upon during development, maybe we could find a way to use them later to re-create conditions that might be therapeutic," Farnsworth said. "If you do it incorrectly, you risk over-proliferation and the development of masses—and cancer." Finding this role for Eyeless is a step in that direction, but it's possible that other molecules also are present and may also inhibit tumor growth, Doe said. "This paper shows that Eyeless is important for winding down the lifespan of the stem cells that are giving rise to the adult brain. It's a stop signal that says it is time to cease responding to Notch signals." While the system used to probe these cells was created for basic science research in Doe's lab, it opens a new window to identify cells involved in the origin of cancers. In this case, tumors induced by Notch signaling in older stem cells were distinct from their earlier versions. Eventually, with more extensive research, the system could provide a roadmap to fine-tuning the timing of stem cell-based therapies to restart healthy activity in adult stem cells, Doe said.